Many people quit their jobs for many reasons. It could be delayed payments, lack of motivation at work, internal organization issues, lack of company growth, and employee harassments, to mention but just a few examples. Reasons such as these and much more can make you leave the office door and never come back to the company the following day. However, quitting your job the right way is important, particularly because you shouldn’t compromise your reputation. To quit the right way, use the any of the following Sample Letters of resignation examples. 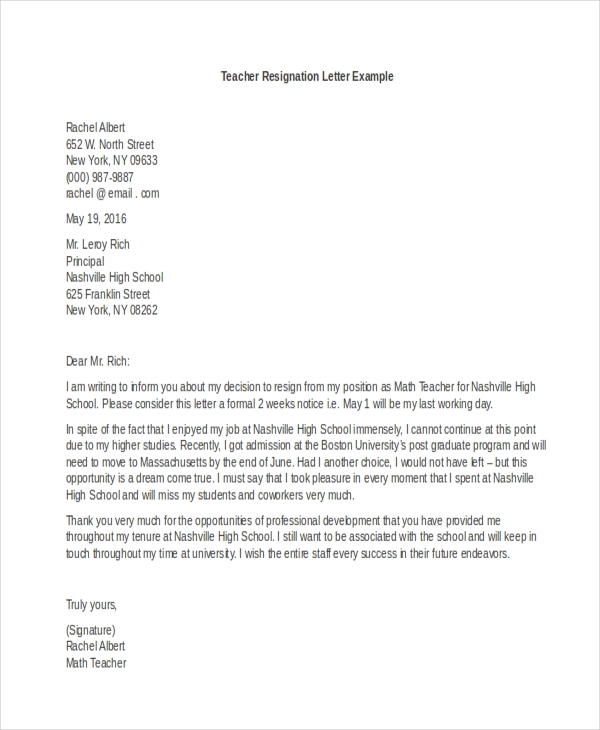 A teacher who wants to quit their job can use this letter to express their intention to do so. This is a standard letter that teachers of all levels can use to relieve themselves off their normal routine at work. This letter is for those who would like to quit their job immediately. You download this file, customize it, and then send it straight away to your boss. Your employer should give you a feedback soon. If you are having a hard time writing a resignation letter because if mixed emotions about your job, you may find this sample letter useful. Just download this, edit the necessary section, and then print it for submission and reviews. A chef can quit their job because of many reasons, whether personal or work-related. If you are a chef and you want to write your resignation letter quick, you can use this sample file to do so. It looks like letters of resignations are now more public than the letter of recommendation or promotion, but it helps to understand that they are quite useful, regardless. When things start to go wrong in a workplace, employees may be forced to pack and go home, either willingly or by demand. 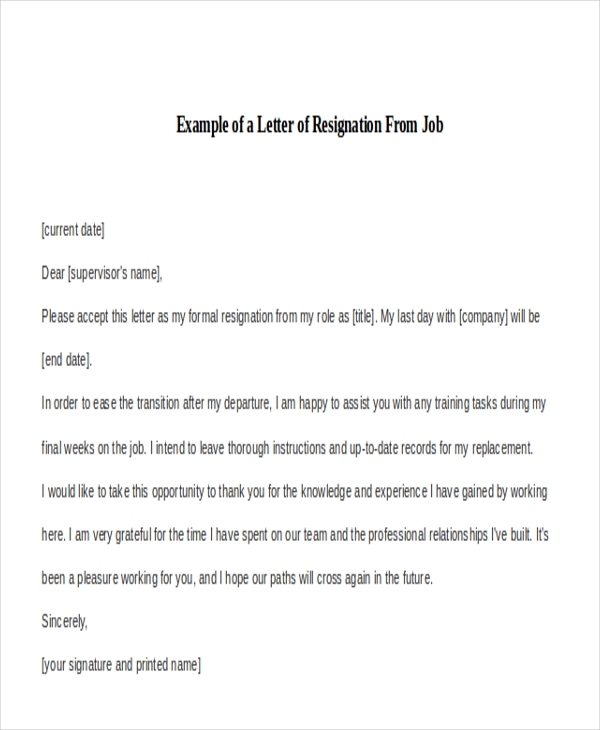 Either an employee or an employer will, therefore, use the letter of resignation example to bring a job to a standstill. You may also see Letter of Resignation. An employee may write a resignation letter if they feel the working conditions in their workplace are not favorable for them. An employer may ask an employee to submit their resignation letter after a series of workplace warning. A member of staff who has found greener pasture outside their parent company can write a two weeks resignation letter notice. The sample letters are free to download. You do not have to spend a lot of time trying to write the letter from scratch when you can really use these sample files to get your letter written in minutes. Of course, you will have to do minor editing, but this shouldn’t take you long. 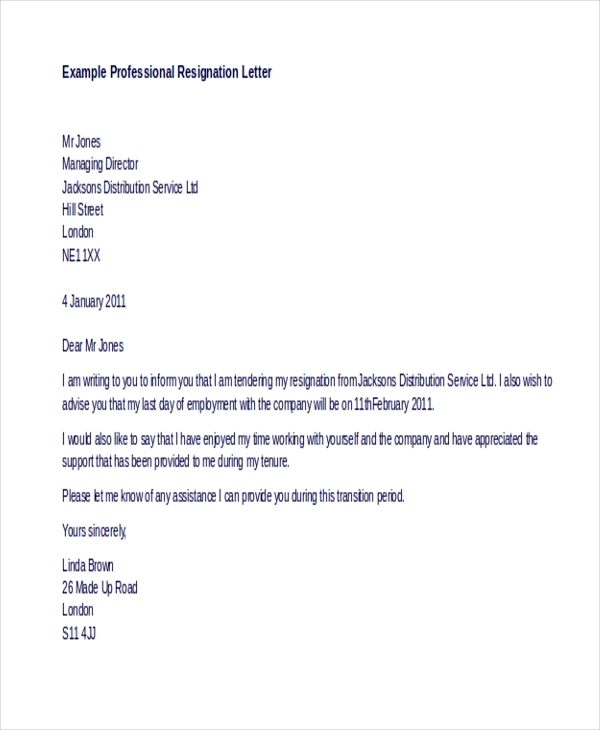 You can also see Resignation Letter Examples. 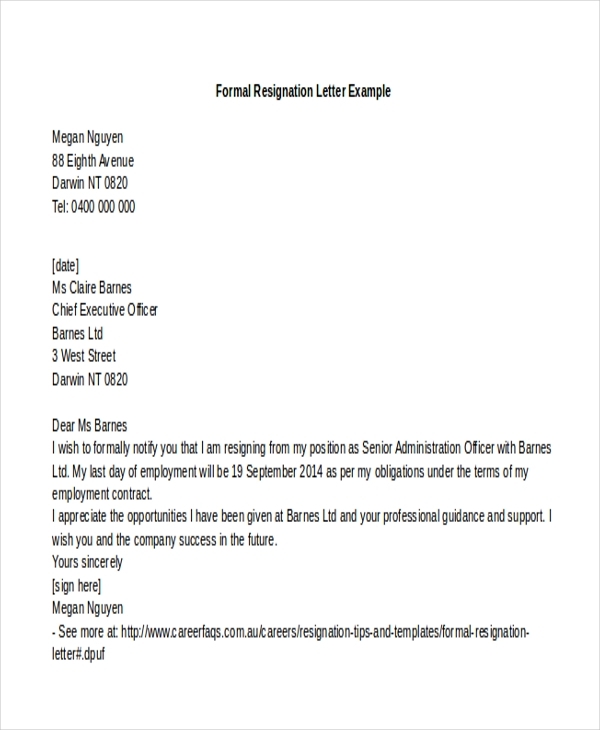 At the end of the day, the sample resignation letter will help you to resign from a job you don’t fancy anymore the right way. It is okay to go home and never come back to work without saying a word, but it is professional to say goodbye to your company by writing a resignation letter.